Episode 6, "Road of Hope"
Synopsis: Edward and Alphonse head back to their hometown of Risembool, escorted by Alex Louis Armstrong. On their way, they meet Dr. Marcoh, a researcher into the military's own efforts to create the Philosopher's Stone, who gives Edward a hint as to where to find his research. In their hometown, Winry and Pinako work on a new automail arm for Ed and adjustments for his leg. They leave with the comfort of knowing they have a place to come back to. Ahhh, just as the dub was improving! Episode 5, "Rain of Sorrow"
Synopsis: The mysterious man, Scar, who kills State Alchemists, targets Edward as he tries to recover from his grief over Nina. Ed and Al flee from the powerful man, and are assisted by Roy, Major Armstrong, Riza, and others, who discover that Scar is an Ishbalan, part of a race that was all but extinguished by the military years earlier. Scar escapes under fire. Ed, his automail arm destroyed, and Alphonse's armor body damaged, have no choice but to return to Risembool for Winry's help. Episode 4, "An Alchemist's Distress"
Synopsis: While a mysterious scarred man kills State Alchemists, Ed and Al are introduced to Shou Tucker, the "Life-Sewing Alchemist", an expert in chimeras, and his young daughter Nina. Edward researches, but takes time to play with Nina, as well. Tucker frets over his upcoming assessment, and makes a tragic decision leading to an abomination, much to the horror of the brothers. However, vengeance is metted out by the mysterious man. Huh. I've got to say, this was actually a pretty well dubbed episode. I was pleasantly surprised, actually. Episode 3, "The Town of Heresy"
Synopsis: In the town of Lior, the Elric brothers learn of a preist named Cornello who can perform "miracles". Investigating, they discover that the man is a fraud, using what seems to be a Philosopher's Stone to bypass the law of Equivalent Exchange. Confronting him, they also expose his deception to the townspeople. Edward defeats Cornello, who goes into hiding, only to be killed by two mysterious figures. Episode 1, "The Fullmetal Alchemist"
Synopsis: A man named Isaac McDougal is terrorizing Central, the capital of Amestris, with his use of water alchemy, heating it up to burn his victims or freezing it to freeze them alive. The President, Fuhrer King Bradley, puts Colonel Roy Mustang in charge of capturing Isaac, who fought alongside him in Ishbal. 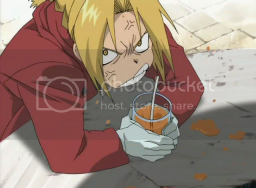 Mustang calls on the help of the Elric brothers, Edward (the "Fullmetal Alchemist") and Alphonse. Isaac plans to kill the Fuhrer using his ice alchemy, which is boosted by a Philosopher's Stone, but it is the Fuhrer who ends up killing him, and the stone in him dissolves before the miltary has a chance to check. Dragon Ball Z. I'd like to think that most of us anime fans have seen at least some of it. It certainly is fantastically popular, all over the world. Even in my budding anime fandom, DBZ may not have been my favorite per se, but it was probably the mark by which all other animated programs at the time were measured. "Is this better or worse than DBZ?" I would ask myself. And even today I consider its influence on my fandom and life in general as being somewhat significant, for better or worse.